More than one hundred people attended the funeral of an 85-year-old Holocaust survivor who had no known family in Canada after a Toronto rabbi issued a plea on Facebook. Newman, a hedge fund manager, volunteers as a rabbi with Bikur Cholim: a Jewish charity that provides assistance to the ill, infirm and vulnerable. 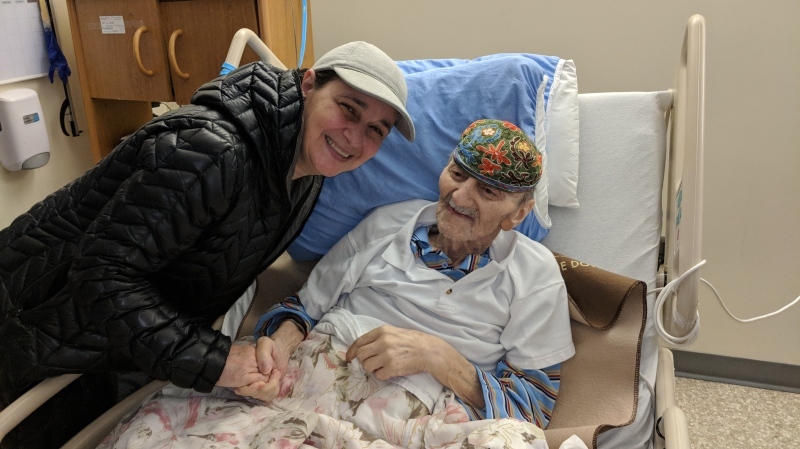 Soon after Eddie Ford was hospitalized with cancer in 2018, Newman began visiting the ailing Holocaust survivor weekly in a Toronto palliative care ward to keep him company and teach him about the faith he was forced to abandon in the 1940s. As Newman tells it, Ford was just six years old when the Holocaust broke out. Living in Budapest, Hungary at the time, his family hid him with a Christian family. Newman said Ford still recalled being in Budapest’s Great Synagogue -- the largest in Europe. “He remembered being a little kid looking up at the dome and thinking that he was looking into the heavens,” Newman said. Only Ford’s brother and mother survived the genocide that claimed the lives of an estimated six million Jews. Ford moved to Canada at the age of 16, and while he always knew of his Jewish identity, he feared that his lack of observance over the years would make him ineligible for a Jewish funeral. “He had a little bit of a religious awakening over the last months,” Newman said. Ford, whose Hebrew name was Efraim ben Dov, passed away on the night of Jan. 29. With his only known living relative being a nephew in Detroit, Newman issued a call on Facebook on the night of Jan. 30 to gather a “minyan” for the funeral of a “sweet Holocaust survivor” at a Jewish cemetery the following day in Richmond Hill, Ont. In Judaism, a “minyan” refers to the quorum of ten Jewish adults needed for a religious service. Only three people responded to Newman’s online request. But when he arrived at the cemetery on Jan. 31, Newman was “stunned” to see more than one hundred people bundled against the biting cold for the ceremony, which a local funeral home graciously offered to cover the cost of. Temperatures, Newman said, had dipped well below -20 degrees Celsius with the wind chill that day. Even Ford’s estranged brother, who had heard about the funeral through the nephew, attended. With Newman’s help, the brother recited the Kaddish: the Jewish prayer of mourning. Ronen Israelski, a Toronto-based filmmaker, was one of those total strangers who attended the funeral. “Growing up in Israel, we’re embedded by those values of mutual responsibility to one another, and when I saw that post on Facebook I just couldn’t ignore it,” Israelski, whose father was also a Holocaust survivor, told CTVNews.ca. Israelski, who moved to Canada from Israel four years ago, was editing a documentary about seniors who were once members of Germany’s Nazi Party when he saw Newman’s post. Newman spoke to CTVNews.ca Monday afternoon, just before officiating at the funeral of an elderly Jewish woman who also had no known relatives in Canada.